Our guide to slot games offers detailed reviews of popular online and land-based slot machines and their manufacturers and designers. Each review covers important details like number of reels and pay lines, jackpot amounts, reel symbols, and special features. We also try to delve deeper into the story behind the game and its designer to offer an additional perspective that we find lacking at other slot review sites. Our game guides also cover the free-play slot market. We see more and more posts by fans of recreational slot machine gambling, people who would no more put real money into a slot machine than they would jump out the window. In many cases, these players are drawn to free-play versions of the same real-money slot machines we cover in other reviews, so the details on these games are useful to both the pay-to-play and free slot markets. We've tried to go out of our way to focus on both the land-based and Web-based slot gambling markets. We've done so because the two markets are so vastly different from one another. Where other slot review sites focus entirely on Web-based slots, we've included some coverage of land-based machine games. In many cases, the two markets inform and inspire one another, so where possible we've tried to highlight the interaction between the two. Our notes on slot machine strategy are wide-ranging and based on decades of experience playing in traditional and online casinos. The strategy posts on our site cover everything from slot myths to thoughts on budgeting and bankroll management. Included is a guide to game selection that we think is the most comprehensive and thorough of its kind. The goal of the site is simple – we want to answer every possible question that a person might have about slot machines, slot games, and the slot industry in general. Where possible, we've included free versions of the games we review, and links to free versions of real games in our designer reviews and other materials. We include these free games because there's no substitute for time spent trying out the real thing, even if you're using play money. Traditional reel symbols have to appear in a specific combination on an active pay line in order to trigger a pay out or other reward. Scatter symbols trigger bonus rounds or pay out jackpots or other prizes regardless of where they land on the game's pay lines. Modern online slots often use scatter symbols to trigger progressive prizes or bonus or side games. Wild symbols substitute for most or all other reel symbols to form winning combinations. Modern wild symbols often perform other roles as well – many will pay off big jackpots for spinning them in combinations of 3, 4, or 5 on a pay line. Still other wild symbols may trigger bonus or side games, or act as scatter symbols. The wild symbol isn't a new innovation, though the ways bonus symbols behave are changing along with the online gaming industry. So-called "expanding wilds" will literally expand and make other symbols wild when they appear in certain combinations, while "stacked wilds" make entire reels wild at once, ideally leading to more frequent and larger pay outs. A bonus game can be any game that takes place outside the standard spinning-reel action of a slot machine. The earliest bonus games were simple gamble features, allowing players a shot at doubling a payout by guessing the color of a virtual card drawn from a virtual deck. These days, online slot bonus games range from simple pick-em games to more complex skill-based shoot-em-up action. A side game is a specific type of bonus game or feature in which the main action of a slot machine changes for a specific number of rounds or until a specific prize amount has been reached. These games are only possible on video slots that don't use a mechanical or electro-mechanical interface. This was a design fad in the late 90s and early 2000s, and has mostly died out in North American and US-facing casinos, though some designers (notably Playtech) are still producing slots with side games built into the design. Usually, these side games are totally different from the traditional reel-spinning action of slot machines. A specific type of bonus game that allows players to gamble their recent slot payout for a chance at a bigger win, usually in a double-or-nothing format. These features aren't as common in land-based or online casinos as they once were, though some companies use them to set their products apart from the competition. An example is Amatic Industries' gamble feature included on every Amatic online and land-based game, which asks you to choose which color of playing card will be drawn from a virtual deck. The payout is double-or-nothing, and is available on every jackpot, no matter how large or small. Invented in the 1980s and widespread by the 1990s, progressive jackpots are prizes that grow depending on the number of wagers played into a machine or network of machines. Modern progressives on the Internet are often linked across massive numbers of online casinos and casino skins from all over the world. The biggest online and land-based progressive jackpots pay off in the tens or even hundreds of millions of dollars, resulting in the largest Vegas and online jackpots in history. Progressive jackpot games have a niche following, though we've all probably played a few bucks into progressive slots games over the years, in hopes of capturing that ever-increasing top prize. Many different types of slot machines exist in today's market. The variety of slot machine styles rivals the variety found in markets like computer and console gaming. Modern slot machine designers have to capture the attention of people raised on top-of-the-line gaming and film entertainment. On the following page is an entire section dedicated to the different types of slots games. 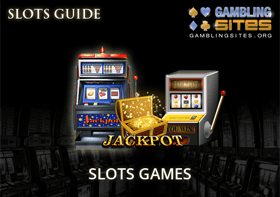 Here's a quick overview of some of the varieties of slots we cover on that page. This phrase refers to any slot machine game that runs without the aid of electricity, computers, or any other fancy gadgets. As far as we know, no casinos are operating mechanical slots as anything except a novelty or lobby display. The earliest slot machines were totally mechanical – they had to be, since they were first played in a part of America that wouldn't have access to electricity for another half-century. Authentic antique mechanical slot machines are collector's items these days, gorgeous gambling props from a time long since passed. Any slot machine that has three reels and a single pay line is technically a classic slot. The phrase can be a little confusing, since vintage slot games from the classic era can also be described this way. Some gamblers enjoy playing classic slots, either because that's the kind of game they're used to playing, or because these games are a kind of mindless entertainment. Another reason some slots fans prefer classic slots is that their simplicity means they accept small wagers and have relatively-high payback percentages. You won't hear this phrase much outside of Australia and the UK, but in those parts of the world it's common slang for the phrase "slot machines." The name comes from the fact that the earliest slot games used symbols styled after fruit – cherries, bananas, lemons, etc. Though the fruit symbol phenomenon has long since died out, the name stuck. In the UK, you'll hardly ever hear the word slot, though everyone knows what a fruit machine is. Another common world slang for the games we call slots – poker machines. This name is popular in Australia and New Zealand, though most people use the shortened form "pokies." Modern slot machines that use video screens instead of real mechanical reels. If you walk into a modern casino, the vast majority of games are video slots. Unless the casino has a few old mechanical games on display for kicks, it's likely that every slot on your average American casino floor is a video slot. This phrase is used mainly to distinguish classic slots from the more modern titles that don't depend on mechanical reels. Any time you see the word "slots" preceded by a money amount, you've just learned something important. A penny slot is any machine that sets the value of one credit as one cent. This phrase does not mean that every spin of the reels will cost $0.01, just that each credit will set you back a penny. Casinos organize their slot sections by the cost-per-credit, loading up on penny slots, but also hosting plenty of nickel slots, quarter slots, half-dollar slots, and dollar slots. Penny slots are generally the least-volatile games on the floor. That means these games (theoretically) take less of your money over time than their more-expensive cousins. Popular slot manufacturer IGT created the Megabucks game in 1986. This was the world's first slot machine that offered a top prize that increased over time as players on a network of machines placed wagers on the game. Called progressive slots, these games shave tiny amounts off each wager and place these money amounts into a common pool. When a player spins a specific combination of reel symbols, this prize money is released all at once. These games are a relatively new phenomenon, considering that slots have been around for more than a century. They are among the most popular games at any casino, land-based or online, because of the obvious appeal of those ever-increasing jackpots. Progressive slots can be linked locally, across multiple casino sites, or even across multiple casinos around the world. Based on the questions we get from newcomers to slot play, Buy-a-Pay slots are the most confusing of all game varieties. All you need to know about these games is that each of the coins you play per spin activates a new set of symbols with a higher pay out rate. When you play another coin, you're "buying" these extra symbols, and buying access to the better pay schedules. The way these games are designed, it's best if you place maximum bets on every spin. The trouble with not playing max coins is that you could spin a big jackpot only to find you haven't activated the proper pay schedule to lead to a big payday. The easiest way to recognize these games is by their odd pay schedules – if you see multiple pay tables based on the number of coins bet per spin, you're playing a Buy-a-Pay slot. Sometimes called ""All-pay" or "All-play" slots, these games have pay lines moving in all directions. Traditional slots pay out from left to right in a straight line and ask gamblers to pay to activate different numbers of lines. Multi-pay slots abandon the line system, requiring only that symbols appear in multiple combinations, regardless of what direction or line they appear on. These games are often categorized by the number of actual lines that can be drawn based on the symbol grid – you'll commonly see games called 243 Ways to Win. These are multi-pay slots that pay out for combinations in 243 different patterns. If a lack of pay lines seems like a great bargain, understand that multi-pay slot games are designed to accommodate for that bargain by requiring large maximum bets. Don't expect to spend less than a few dollars per spin for a chance at all those ways to win. Modern slot designers rely on all sorts of bells and whistles to give their games replay value and to make their titles stand out from the crowd. Games that incorporate 3D graphics are becoming commonplace, as 3D technology becomes more available to game designers. Audiences are becoming used to 3D technology, thanks to a spate of 3D movies, and the wide release of 3D televisions. In short – 3D is a buzzword again, and it's no surprise that slot designers would try to cash in on it. You'll find a few 3D slots in land-based casinos, though the phenomenon is mainly Web-based. If a slot machine game is available to play on an Internet connection, it's an online slot. The first slot machine games on the Internet appeared in 1996. Produced by Microgaming, a design company that's still an industry leader, no one would have thought that this simple game would be part of a multi-billion dollar industry one day. The phrase "online slots" is very generic. It can refer to pretty much any type of game you'll find on this list. Online progressive slots are popular, as are licensed games based on video games, movies, and TV shows. 3D slots are popular choices for online players, and what are mobile slots if not a super-portable online slot machine game? Games designed for play on smartphones, tablets, and other on-the-go gadgets. Mobile gaming is nothing new – people have been playing simple games like solitaire on their cellular phones since the first brick phones of the 1980s. The difference with mobile slots is that they're fully-featured, available for play with real money, and available in a variety almost as good as what you find at traditional Web-based casinos. Games designed for players that like to make big wagers. A high-roller slot can be any game that you think costs a lot of money to play per-spin. To some players, a $5-per-spin wager is a high-roller bet. To other players, that's a totally realistic number. How high can these wagers go? The sky is technically the limit. We've reviewed online slot games that can be played for as much as $1,250 per spin – that's a high-roller slot machine by anyone's definition. These games do give players something in exchange for their big investment. They offer large jackpots, multiple bonuses, wild symbols, free spins, scatters, and a high payback percentage. Games designed for players who like to make very small wagers. A low-roller slot is any game that can be played for small max bets. Like the definition of "high-roller slots" above, the definition of a low-roller slot is variable from player to player. Generally speaking, slots that cost less than $0.50 for a max bet per spin are low-roller games. In exchange for their low cost, these titles have low theoretical payback percentages and few features, if any at all. Just as there are a number of different types of slot machine games available, those games are produced by a variety of different manufacturers and designers. Many of these companies started out as designers of land-based slot games before moving into the online market. Others were born as online game design firms and have recently moved into the land-based market. They all have interesting background stories that can teach us plenty about the business of producing slot machine games. The following section is dedicated to the various manufacturers and providers of online and land-based slot gaming. Each of the providers shown below are covered in the above section.